Militants in Nigeria's oil heartland said on Saturday they had used missiles, grenades and speedboats in a deadly offensive against army positions, but the military denied it had come under attack. 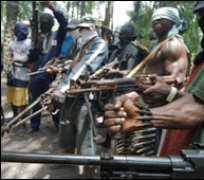 The Movement for the Emancipation of the Niger Delta (MEND) said it killed 29 soldiers in attacks in three separate locations, which it said it launched in response to the killing of civilians by security forces. "Operation Hunter Hunted involved the use of several fast attack speedboats, general purpose machine guns, rocket propelled grenades and deadly Soviet-made anti-tank missiles at close range combat," MEND said in an e-mailed statement. "The precise locations of the battles are Odiama creek in Bayelsa, Opia river in Delta, and the confluence of Bonny and Andonni river in Rivers state," the statement said. MEND said six of its own fighters died in the co-ordinated attacks launched at around 19:30 (1830 GMT). The Niger Delta is a vast network of narrow creeks and remote villages, and initial reports of fighting are often confused. The military and the militants regularly accuse each other of propaganda when clashes take place. Lieutenant-Colonel Rabe Abubakar, military spokesman for Bayelsa and Delta states, denied the army was under attack, saying soldiers were manning their positions as normal. "There is no iota of truth in the claim by MEND. All of our men are intact. ... We are not engaged in any combat," he said. It was not immediately possible to independently verify the claims made by either side. The Niger Delta is the heartland of Nigeria's oil industry, which is currently pumping around 1.9 million barrels per day, making the country the world's eighth biggest oil exporter. Insecurity in the region has cut output by around a fifth since early 2006, when MEND began blowing up oil pipelines and kidnapping foreign workers, helping push up world energy prices. The group said the latest attacks had been launched in response to what it called supposed "warning shots" by the military in the delta's inland waterways, which MEND said had killed civilians including women and children. It said the wreckage of gunboats were still burning when its fighters left the scene of the clashes. Security analysts in Nigeria said MEND was known to have been planning fresh strikes against army positions in the delta and forecast that there were likely to be more such attacks. The militant group says it is fighting for a fairer share of the resources in the region, but armed gangs have taken advantage of the breakdown in law and order and the line between militancy and rank criminality has become blurred. President Umaru Yar'Adua, who took office in Africa's most populous nation more than a year ago, has pledged to bring development to impoverished villages in the delta in an effort to address the root causes of the unrest. But there has been little tangible progress. A long-awaited peace summit has been cancelled and kidnapping, mostly for ransom, remains frequent. Gunmen are still holding an Israeli businessman abducted late on Tuesday from his home in the main oil city, Port Harcourt.